Detection of avian influenza hemagglutinins (subtypes H5 and H7) in cells infected with recombinant Newcastle Disease Viruses NDV-H5 and NDV-H7, by Immunofluorescence, Flow cytometry and western blot. Human influenza A and B viruses cause seasonal epidemics of infectious respiratory disease typically during the colder months in the Northern and Southern hemispheres. Human and animal influenza viruses are emerging pathogens that pose significant threats to public health. Zoonotic influenza viruses of animal origin can cause global pandemics of influenza. Major areas of focus for the influenza virus research program in the Garcia-Sastre Lab include studies of the interactions between these viruses and their hosts, including humans and animal models of influenza, and development of novel vaccines and therapeutics to prevent or reduce influenza disease. This research program is supported by the Center for Research on Influenza Pathogenesis (CRIP), one of five NIAID Centers of Excellence for Influenza Research and Surveillance (CEIRS), and FluOMICS, a NIAID-funded program project. Experiments involving pathogens of high public health consequence can be safely conducted within the Emerging Pathogens Facility (EPF), an enhanced biocontainment facility that is a unique resource of the Global Health and Emerging Pathogens Institute (GHEPI). 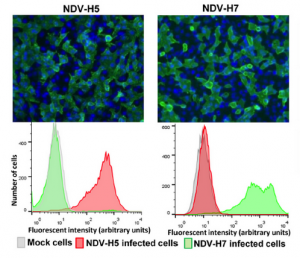 The influenza virus research program complements other areas of research that are focused on examining viral IFN antagonists and IFN-mediated host responses. Elena Moreno Del Olmo, Ph.D.
Luiz Gustavo dos Anjos Borges, Ph.D.